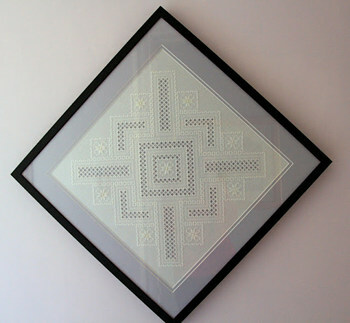 Col's Creations Traditional Hardanger Designs - Stocking Both Easy And More Advanced Embroidery Chart Packs - Charts Can Be Stitched In DMC, Anchor Or Caron Threads. Welcome to our online store. 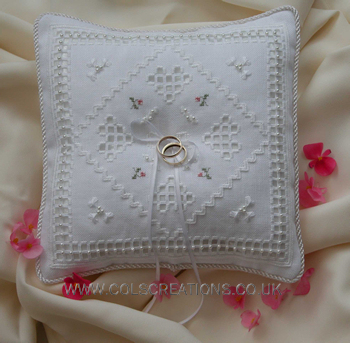 Here you will find a wide variety of traditional Hardanger designs created by the UK designer Colette Robinson, which include both traditional and speciality stitches. We only stock chart packs, sorry no kits. Included in the pack is a colour picture of the finished article, a list of materials required, instructions, stitch diagrams and a full working chart. Supplying our products to you direct from the designer enables us to keep our prices down. Payments may be made using your credit/debit card or your PayPal account, these are handled for us by PayPal Ltd using their secure payment system, so you can feel confident in your purchase. Why not treat yourself to the Festive Sparkle Candle Mat and Festive Sparkle Candle Wrap, when purchased as a set you save 10% on the normal retail price, take a look here for details. Are you looking for a bargain, then why not treat yourself to the four seasons chart pack which saves 12.5% than if they were purchased separately. For full details take a look at the Four Seasons Tile Pack today. 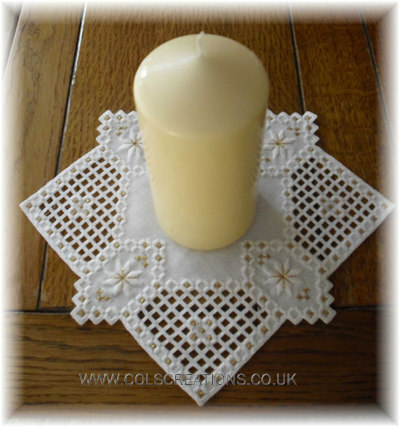 A classic Hardanger table centre that would look beautiful in anyone's home. 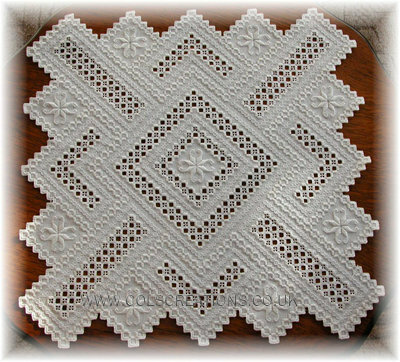 Worked in just two different perlé threads throughout and several Hardanger stitches with that classic white on white look, the beauty of this piece is in the detail. The chart can be found here. Have you stitched one of our designs? Have you changed the original colour scheme? Have you found a novel use for your purchase? If so what not share your work with others; We have a small select Customer Gallery where you can show off your handy work. Getting married? Know anyone who is? Because this is an absolutely stunning design which would look perfect on that special day. There are many details and accessories required for the ceremony, but not surprisingly the ring pillow may be considered one of the most crucial. The use of a ring pillow to transport the rings during the ceremony emphasizes the rings importance and what they will represent. It is fitting then, that this ring pillow was designed for just such an occasion. Taking a closer look reveals what else, but hearts and flowers. The outer border consists of Kloster blocks and woven bars which are studded with elegant Guttermann pearl beads. The four corner motifs are made up from a series of Rhodes hearts. The inner blanket stitch border holds yet more hearts, this time using Kloster blocks and woven bars. 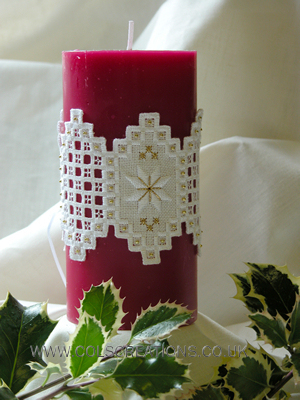 The addition of a small splash of colour for the cross stitch flowers gives a really elegant look to the whole design. Finally, a white ribbon attached to the centre of the pillow may be used to securely attach those very important rings. The final touch on this pillow was the use of a white silky fabric to back the pillow and to trim the edges with white twisted cording. The chart for this design gives you both full instructions for the Hardanger cover and also the very important making up instructions to complete the pillow. 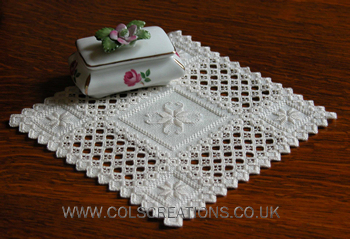 At Col's Creations, we carry a growing range of traditional hardanger designs. Most of our charts are quite simple, which makes them ideal for an easy introduction into hardanger. All of the designs have been produced by the UK designer Colette Robinson. By dealing direct we can reduce our costs, which then means that we are able to supply our chart packs direct to you at great prices. All of our charts contain full design information, stitch diagrams, cutting charts and easy to follow instructions and all of which have been stitched on a variety of fabrics using threads from DMC, Anchor and also Caron. 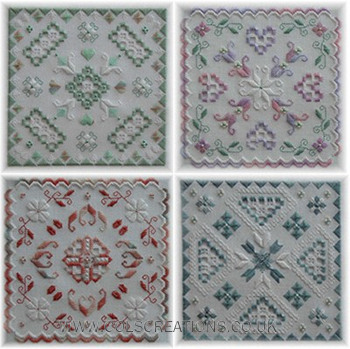 Most designs incorporate the same basic Traditional Hardanger core stitches, which include Back Stitch, Doves Eyes, Woven Bars, Blanket Stitch, Algerian Eyelets, Kloster Blocks and Satin Stitch to name but a few. We can take your order online, we accept most major credit/debit/charge cards and also PayPal. Thank you for taking the time to look around our store and we hope you will find something of interest.